My Year of Meats is a remarkable novel. Ruth Ozeki, a shortlisted Man Booker Prize author’s control over language is such that a book that pivots around the poor standards of meat production in America is somehow incredibly beautiful, leaving the reader with a prevailing sense of serenity. The narrative predominantly focuses on two characters, Akiko and Jane. Akiko is a meek Japanese housewife, whose oppressive husband, John turns increasingly abusive throughout the novel, climaxing in a graphic scene where Akiko is hospitalised. John, obsessed with the values of America, becomes frustrated that his own wife does not share these ideals. Though seemingly fundamentally different characters, Akiko is linked to Jane by the very clever device of Shonagon, a 10th century female writer whose musings on life transcends cultural boundaries, offering truths common to both women. Jane Tagaki-Little is a Japanese-American documentarian whose “starving-artist” phase is brought to a halt by a call from her former boss in Japan. She is tasked with the role of researching and directing a television series for a Japanese audience about the lives of American Families, called My American Wife. Her brief is to present the subjects of the show – young, attractive wives, as both “wholesome” and “authentic.” Each episode centres around a wife from a different American State who cooks and presents a signature meat dish. A fairly uncontroversial subject at first glance, My American Wife has much more sinister undertones when considering that its sponsor, Beef-Ex is an American meat corporation with aims to exploit the untapped market of American meats in Asia. In an increasingly diversifying America who’s developing attitudes towards race, gender and sexuality means that “traditional” and “authentic” no longer mean the same thing, Jane is uncomfortable with feeding such falsities to her audience. She daringly takes the programme in another direction, with aims to show real American lives, going against the wishes of the sponsors in the process. Yet in her pursuit to portray America as it really is, she discovers some shocking truths about its meat-industry that are hard to stomach. If abortion inducing hormones and faeces-fed animals don’t sound palatable, you might want to but that burger down now. A moving tale of courage, compassion and catastrophe, Ozeki’s refreshing prose present a message that is hard to forget. It is testament to her strength as a writer that even the most carnivorous amongst us will question their eating habits after reading this book. 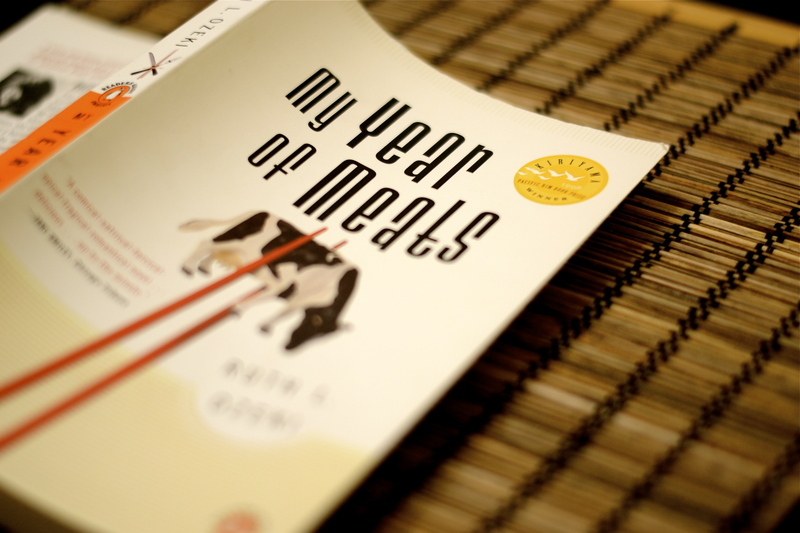 My Year of Meats is an incredibly powerful novel whose tough topics really give us something to chew over. Beci Moss is a second year student at Edinburgh University. She studies French and Philosophy. She is Welsh. She is also a huge fan of Iggy Azalea – although if we’re honest she thinks that now Azalea’s hit the mainstream it’s unlikely that she’ll reach the heights of tracks such as My World and Pu$$y. Pu$$y was great – wasn’t it? I read this article and found it very interesting, thought it might be something for you. The article is called My Year of Meats – Ruth Ozeki and is located at http://prancingthroughlife.com/2013/11/06/my-year-of-meats-ruth-ozeki/.